Henry Chen is no stranger to the BPO. He has been on both sides of the orchestra’s podium. He was a pianist in the orchestra in 1991; in October 2000 (when Conductor Emeritus Raffaele Faraco played two violin concertos in the concert, by Max Bruch and J. S. Bach), he was the Guest Conductor. Henry and his wife, Linda, have also been longtime audience members of this orchestra and steady contributors to it (dating back to the time when it was still the Gettysburg Symphony.) They are very much looking forward to taking a more active role in the BPO’s life. His involvement in the music community of Baltimore started in 1964 . . . that year he was admitted into the Bach Society of Baltimore as a tenor, and also started as the pianist at Caroline Street United Methodist Church. In the intervening decades, he has been a member of most of the premier choral groups in area: the Bach Society of Baltimore with George Woodhead, the Baltimore Pro Cantare with John Heizer, the Baltimore Choral Arts with Ted Morrison, the Handel Choir with Saul Lilienstein, the Baltimore Symphony Chorus with Andrew Schenck and Edward Polochick, the Towson University Community Chorus with Gil Brungardt, the Baltimore Masterworks Chorale with Mark Hardy, and now the Bach Concert Series/Bach in Baltimore with Herbert Dimmock. He has performed most of the large choral masterworks: Bach's St. John and St. Matthew Passions, B-minor Mass, Christmas and Easter Oratorios; Haydn’s “Nelson” Mass; Mozart’s Requiem Mass; Beethoven’s 9th Symphony; Berlioz’s L‘Enfance du Christ; Brahms’ “German” Requiem; Verdi’s Requiem; and Orff’s Carmina Burana. From 1964 to 1987 he was in charge of music programs at United Methodist Churches, ending with a nine-year tenure at Lovely Lane UMC, the “Mother Church” of American Methodism. In preparation for Methodism’s Bicentennial year celebration, he directed the professional choir and instrumentalists in the 1983 Christmas Eve Service broadcast nationwide on CBS. Since April 1988 he has been associated with the Episcopal Church, and was Music Director at St. James’ Monkton for almost 23 years. Though now officially “retired” from church-music, he has been long-term interim Organist-Music Director at The Episcopal Church of the Advent (in Federal Hill) and St. James’ Episcopal Church (Lafayette Square). 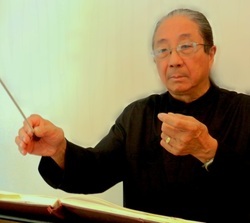 While at Lovely Lane, he was asked in 1979 to be the founding Music Director of the Baltimore Chamber Consort, a member-created orchestra performing works through the early Romantic. Quite a few of the present BPO members date their playing with him from the Consort. Though a chamber group, he often expanded forces to full symphony concerts. Its repertoire included overtures, concertos, symphonies, and masses, including works by Bach, Hummel, Mozart, Beethoven, Bizet, Dvorak, and Wagner. Choral masterpieces featured include Dubois’ The Last Seven Words of Christ, Haydn’s “Nelson” Mass, and Brahms’ "Ein Deutsches Requiem.” During this time he was also Guest Conductor in choral-orchestral concerts with The Choral Society of Carroll County, and the Deer Creek Chorale (Harford County). As a child Henry studied piano with Elijah Yardumian, a graduate of Curtis Institute of Music in Philadelphia. He has studied organ in Baltimore with George Woodhead (Peabody Conservatory and Goucher College), Thomas Spacht (Towson University) and Terry Yount (Towson University). He studied choral and symphonic conducting from those under whose direction he has performed, as well as from B. Grosbayne and M. Rudolf. He was born in Shanghai, China. His parents moved to the Philadelphia area when he was seven, and he graduated in 1958 from Westtown School, a Quaker coeducational boarding school near West Chester, Pennsylvania. He spent an interim year at the Wilhelmsgymnasium in Kassel, German. He holds a B.A. (1963) from Harvard College, an M.A. (1969) from The Johns Hopkins University, and a Ph.D. (1983) from The University of Maryland, College Park. He is presently Professor Emeritus of Physics at Towson University, having retired in June 2009 after having been a full-time faculty member for 44 years.